Electromagnetic field (EMF) consists of waves of electric and magnetic energy moving together through space. Often the term "electromagnetic field" or EMF is used to indicate the presence of electromagnetic radiation. EMF occurs naturally, with the earth, the sun, and the ionosphere are all natural sources of EMF in our everyday lives. All radio communications systems use the radiofrequency (RF) part of the electromagnetic field (EMF) spectrum between 3 kilohertz (kHz) and 300 gigahertz (GHz). These include TV, AM and FM radio broadcasting, mobile phones and their base stations, paging services, cordless phones, baby monitors, and emergency and rural communications systems. When a call is made from a mobile phone, RF signals are transmitted between its antenna and the antenna at a nearby base station. The phone call is then routed through the phone network to the destination phone. Base station antennas must be elevated and located clear of physical obstruction to ensure wide coverage. 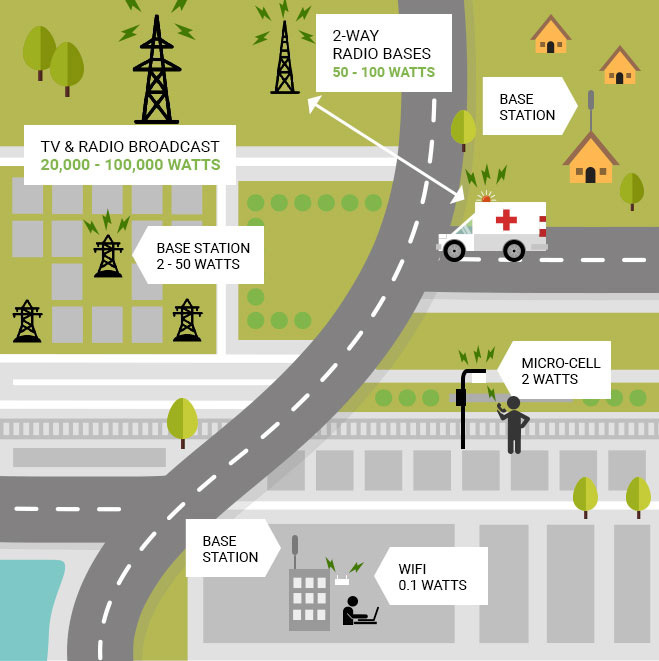 In an area of increasing mobile phone use the number of additional base stations needed to maintain service quality increases, even in areas where mobile network coverage already exists. If this is not done the mobile network will not operate properly and, as a result, mobile phone users may not be able to connect to their network. 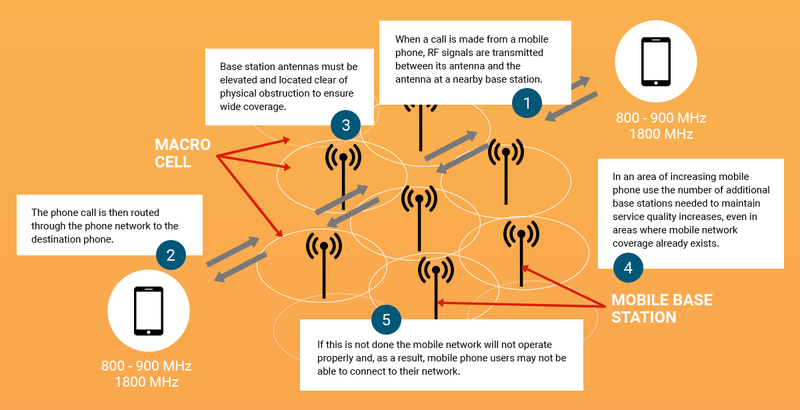 Lack of base stations will result in weak signal coverage for a certain area. A weak signal will cause your phone to automatically increase power to a maximum as the phone repeatedly attempts to connect to an antenna. Thus giving off more RF-EMF emission.